The product has a pretty catchy name. It’s called the ArachniGrip Slide Spider. Yes, arachni, as in arachnid, the scientific name for spiders. Now, I am not ashamed to admit that I absolutely hate spiders. But, luckily, I overcame my long standing hatred for the things, long enough to test out this product. And, while I still loath eight legged creatures, I absolutely love my ArachniGrip Slide Spider! So, what is it? 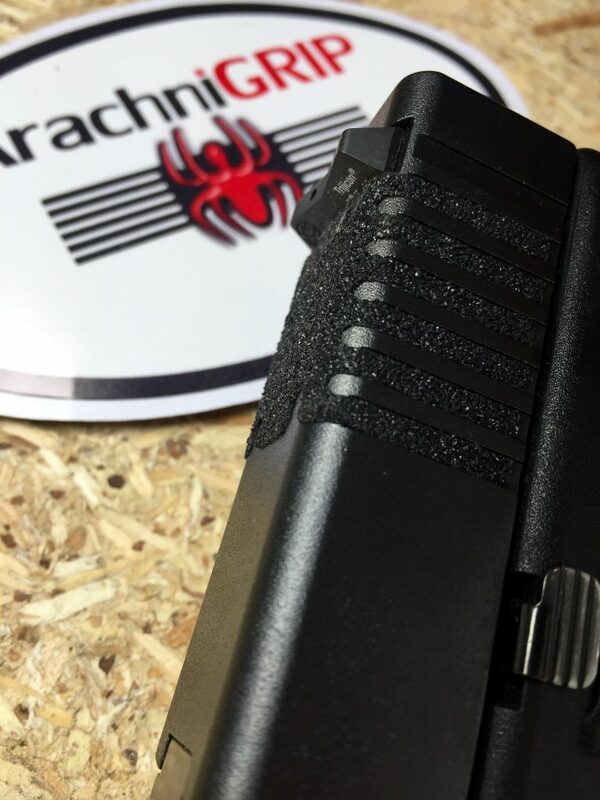 ArachniGrip is a custom cut, grip tape material, that is applied to the slide of your firearm. 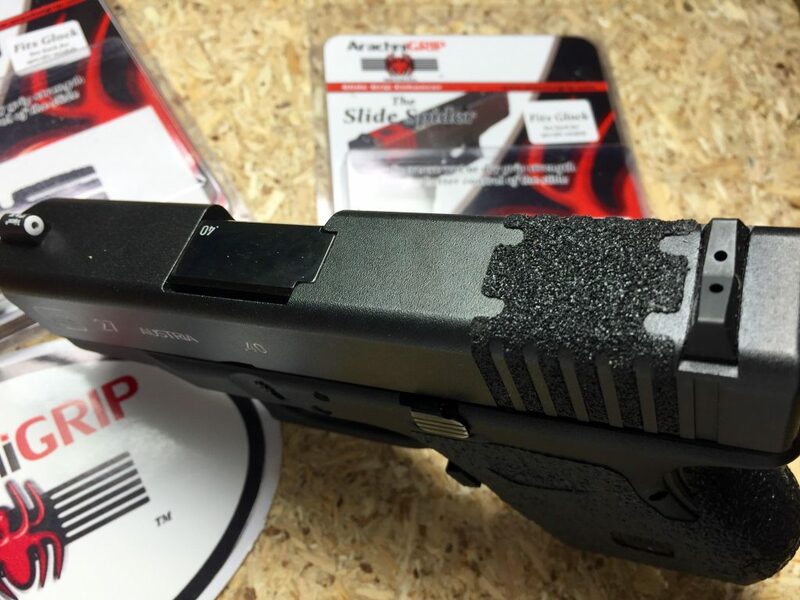 If you are familiar with the applied tape grips from companies like Talon Grips, it is the same concept, except this is specifically cut for the slide. There are several reasons why I really like this product. Assisting with weak hand strength – You may have weak hand strength, have arthritis or a physical disability that makes racking the slide difficult. Yes, manufacturers cut serrations in the slide to help grip, but for some people these are simply not enough, or really are more for aesthetics than function. The ArachniGrip gives the person something to substantially grip and it absolutely makes a difference. Now obviously, it does not physically change the amount of force needed to rack the slide. But, it does however, give the person more texture to grip, resulting in more leverage and easier sliding. Good for gross motor skills – For those of you who are not familiar with personal defensive shooting, or shooting under high stress, your body does some strange things. Without going off on a human physiology tangent, I’ll give you the lowdown on why the ArachniGrip is great for high stress defensive shooting incidents. When you are faced with a stressful situation, your brain goes into the fight or flight mode. Your body instinctively releases adrenalin and other chemicals to help you focus, fight, react quicker, and perceive time differently (your brain actually makes it feel like time slows down). Pretty cool right? But, some of this comes at a price. Your field of view narrows, creating the ‘tunnel vision’ you most likely have heard of. Your hearing is diminished, called auditory exclusion. And most importantly for this discussion, your fine motor skills disappear. By fine motor skills, I am talking about the ability for your fingers to do precise small movements (thread a needle, button a shirt button, etc.) When these fine motor skills disappear, we have to rely on gross motor skills. This is one of the reasons why when practicing magazine changes, it is preferable not to use the slide stop to release the slide forward after inserting the magazine. That slide stop is quite small, and with fine motor skills compromised, it becomes more difficult to ensure you release the slide and get the gun back into action. So the preferred method is to grip the slide, rip it to the rear and let it go. This action does not use fine motor skills. Rather, it relies on the gross motor skills used when your body is in that flight or fight mode. Yes, that is a long explanation of why having extra grip on your slide in a situation like this is pretty awesome. 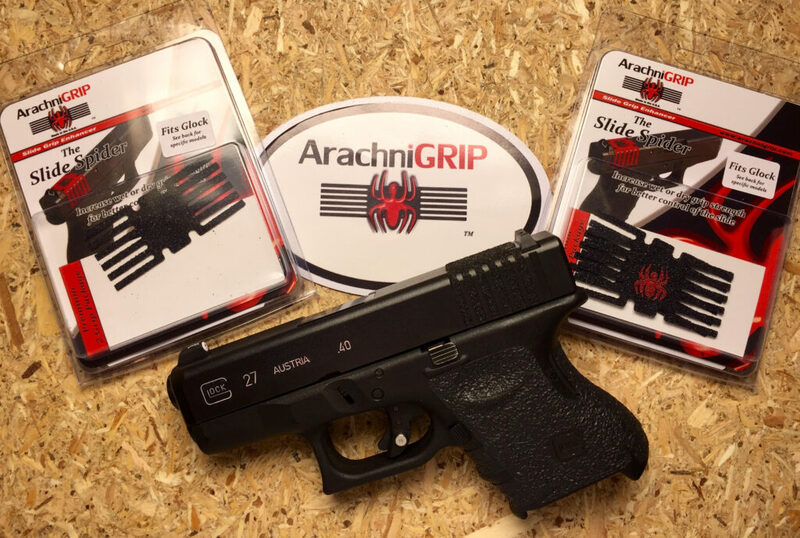 The ArachniGrip would also seem to be a great help for sweaty or dirty hands with little to no fine motor skills attempting to rack a slide after a magazine change. I received two sets of ArachniGrips for my Glock 27 for testing. I received a set of all black, and a set of black with a red ArachniGrip logo. Each package came with two grips and an alcohol cleaning cloth that is supposed to be used to clean the surface before installation. The package provides really good instructions, but there are also descriptive videos you can find online on how to install the ArachniGrip. It took me about 5-10 minutes total to install the grips. The process is very simple and involves cleaning the slide, positioning the grip, smoothing it out, heating it with a blow dryer and then pressing it some more. One thing I was worried about when I first looked at the product, was that it may be too aggressive and ‘grippy’. I didn't want something snagging my clothes, or holster or rubbing my skin raw. The cool thing about the ArachniGrip though, is that the grip actually sits inside the serrations on the slide, so it really is not exposed. It is only really felt when your fingers are pressed into the serrations. So I had no issues of comfort or snagging because of the ArachniGrip. I imagine there will be some wear on the inside of the holster where the holster is in constant contact with that area of the slide, but such is life. Durability wise, I have not had it long enough to tell you how long it will last, but the manufacturer says each grip will last over 1000 cycles. I imagine that will be quite a long time, and remember it comes with two grips. ArachniGrip has options for most of the major manufacturers, and they say they can even do custom cuts if your firearm is not listed. They also have several colors and designs available, including a ‘thin blue line’ logo which is much appreciated! I also got great customer service from ArachniGrip, which is a big consideration for me. Overall, I really like the ArachniGrip and was pleasantly surprised that it really did help in racking the slide. Before you get rid of that firearm, because you can’t rack the slide, you could try this out. At a price point of around the cost of a tank of gas, the item is something that wouldn’t break the bank even if you tried it and it didn't float your boat. I do however think that this could definitely be a help to the elderly or those with physical issues that make it difficult to rack the slide. My ArachniGrip Slide Spider is staying put on my every day carry Glock 27. Any other spiders I see can stay away. Sounds good to me – I will have to try them out. Roamer in Texas. Hi Ben, these really are a great product that can absolutely make a difference in grip. Glad you liked the review!! Once you put them on, come back and tell us what you think!